The Earth contains a lot of iron, but it is not alone in the solar system in that aspect. Venus, Mars, the Moon and asteroids such as Vesta all have iron in their structure, but Mercury is the champion in that aspect: about 70 percent of its mass is iron! Now, researchers believe they have found why Mercury is so rich in this metal – the planet is the result of a cosmic ‘hit and run’. 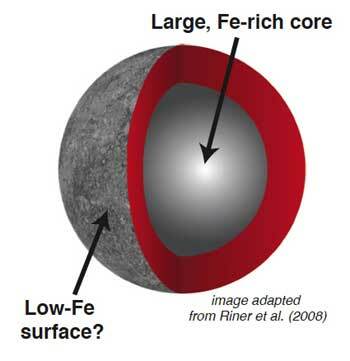 The main proposed reason for the lunar iron is that the Moon was formed as a result of a giant impact with proto-Earth – but that can’t account for the much vaster Mercurian iron. Such a scenario requires that proto-Mercury was blasted apart with far greater specific energy than required for lunar formation, but in such a way that it retained substantial volatile elements and did not reaccrete its ejected mantle – in other words, something struck Mercury so hard that the planet lots half its mantle in a collision with proto-Earth or proto-Venus, leaving behind the iron-rich body we see today. The mantle which was torn from Mercury also didn’t re-accrete on to the planet. Erik Asphaug from Arizona State University and Andreas Reufer of the University of Bern developed a statistical scenario for how planets merge and grow; apparently, Mars and Mercury lucked out, but in different ways. “How did they luck out? Mars, by missing out on most of the action – not colliding into any larger body since its formation – and Mercury, by hitting the larger planets in a glancing blow each time, failing to accrete,” explains Asphaug. Their model showed that this was unlikely, but not extremely unlikely. The rather surprising result the model projected was that hit and run collisions are might not have been that uncommon in our solar system. Scientific Reference: Mercury and other iron-rich planetary bodies as relics of inefficient accretion.